short girl, long island. : Teach Me Something Thursday, Volume Three. The third installment of TMST introduces another area I am fond of - clean beauty. Nia, who blogs over at CherryFashion, gives us a great recipe for a nourishing hair mask! I love my hair, and I know you do too. So I decided to share a super easy recipe, which you can use to nourish your hair and it can all be done at home. Forget chemicals and spending loads of money on hair masks sold in stores. Forget waiting till your stylist is free and paying him/her for making a hair mask. Go into your kitchen and get a few items, which you can use to get beautiful, healthy hair. If you don't have any of these items (for example coconut milk) just go to your local food store, they should have it. 1. Mash the avocado in a small bowl. 2. 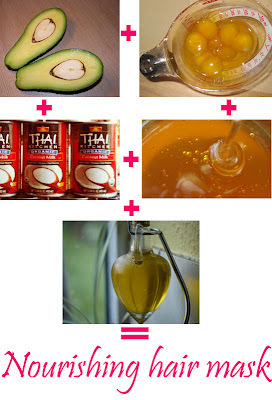 Add the egg and mix it together properly so the egg white and yolk are properly mixed with the avocado. Apply this mask on your hair for 30 minutes. You can apply heat to it to let the hair absorb the vitamins and minerals better. Or you can just apply it and leave it on longer if you can. This just gives the mask more time to do it's magic. Wash it off with warm water and then wash your hair like you normally would. Avocado - It is rich in vitamins and minerals, like all fruits and vegetables. It has been shown to contain pantothenic acid, which is said to reduce gray hair. It is also believed to help in hair growth. Olive oil -Reduce hair loss and stimulate hair growth. Coconut milk -It is rich in protein, essential fats and iron. Prevents thinning, stops hair breakage and boosts hair growth. Eggs -High protein content which can be used to strengthen hair follicles. Honey -It is a humectant, which adds moisture to your hair. Soft, supple, shiny, healthy looking hair. Check out more of Nia's clean beauty recipes (like this simple face scrub) over at CherryFashion! This looks interesting and I love that its with all natural ingredients. I know, its awesome. I plan on trying it sometime next week.